Everett's Nordic Ski Committee conducts courses and outings that emphasize safe winter travel using cross-country gear. From groomed tracks to untracked snow on back-country roads, ski with us and "free your heels to free your mind". "Nordic" skiing (also called Cross Country skiing) is usually on groomed trails or roads, both uphill and down, where your heel is free to lift. Our program includes a Nordic Ski Course, instructor training, and a variety of organized trips. Our Nordic course is designed for beginners, experienced skiers who want to brush up their skills, and downhill skiers who want to try something new and away from the crowds. The general public is welcome with a free, guest membership. Our lectures cover clothing and equipment, fun places to ski, the 10 essentials, Sno-Park passes, winter hazards, and avalanche awareness and avoidance. During field trips we cover the diagonal stride, uphill technique, turning, and other methods of speed control. The field trips are at both groomed and un-groomed areas. Our goals are to focus on the fundamentals, ski safely and have fun! Avalanche awareness and avoidance is introduced in the Nordic course, but advance training is offered through our Avalanche Course. To join us on an Everett-sponsored ski trip, browse our ski activities and sign up. Follow our Nordic Ski group on Facebook! 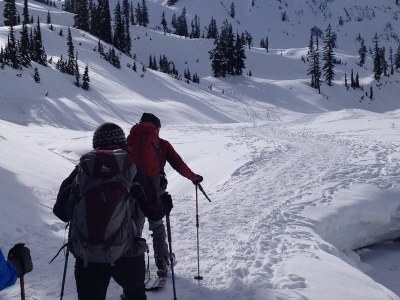 Volunteering to help with courses, seminars, and ski trips is a great way to keep your skills set up, and give back to the mountaineering community. The Nordic Ski committee meets the second Tuesday of each month. Contact us at Ski-Nord@EverettMountaineers.org for the time and location. You are welcome to attend.